"The best sales book of the year" — strategy+business magazineThat gap between your company’s sales efforts and strategy? It’s real—and a huge vulnerability. 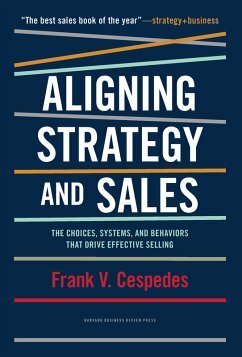 Addressing that gap, actionably and with attention to relevant research, is the focus of this book.In Aligning Strategy and Sales, Harvard Business School professor Frank Cespedes equips you to link your go-to-market initiatives with strategic goals. 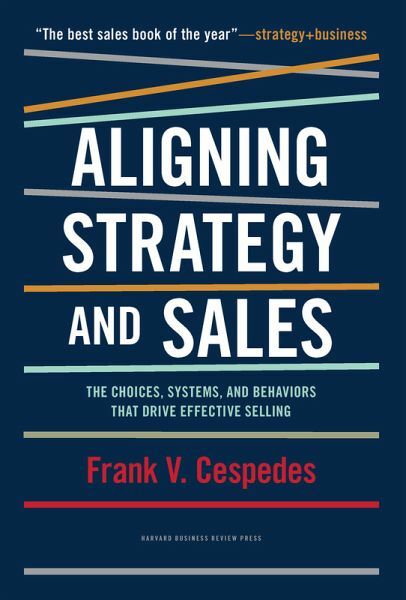 Cespedes offers a road map to articulate strategy in ways that people in the field can understand and that will fuel the behaviors required for profitable growth. Without that alignment, leaders will press for better execution when they need a better strategy, or change strategic direction with great cost and turmoil when they should focus on the basics of sales execution.With thoughtful, clear, and engaging examples, Aligning Strategy and Sales provides a framework for diagnosing and managing the core levers available for effective selling in any organization. It will give you the know-how and tools to move from ideas to action and build a sales effort linked to your firm’s unique goals, not a generic selling formula. Cespedes shows how sales efforts affect all elements of value creation in a business, whether you’re a start-up seeking to scale or an established firm looking to jump-start new growth. The book provides key insights to optimize your firm’s customer management activities and so improve selling and strategy. Frank V. Cespedes is the MBA Class of 1973 Senior Lecturer of Business Administration at Harvard Business School. He has run a business, served on the boards of established corporations as well as start-ups, and consulted to companies around the world. He is the author of six books and many articles in Harvard Business Review, the Wall Street Journal, California Management Review, and other publications.